In recent years, the first BMW M3 has become slightly more known for its ability to rival air-cooled Porsche prices at online auctions than for its driving prowess. The truth is the E30 M3 is excellent to drive, but its high-revving four-cylinder engine isn’t for everyone. 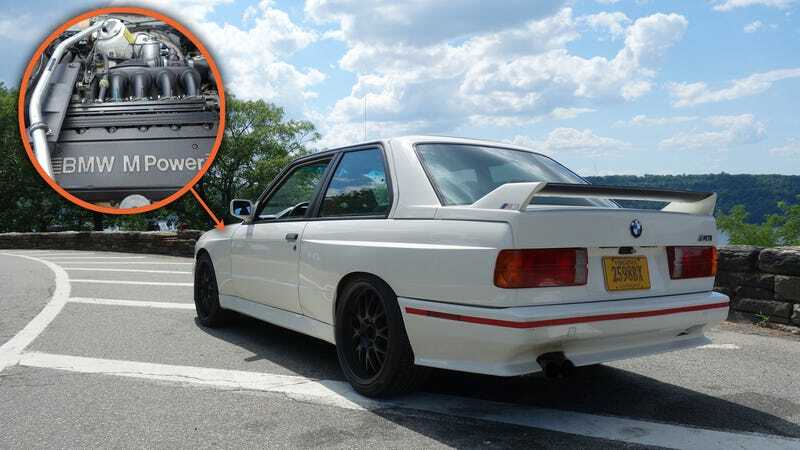 Here’s what you should do instead of shoving your E30 M3 into a hermetically sealed bubble and waiting for its price to go up so you can retire on the Bring A Trailer sale: give it a beefier engine and then actually drive it. I came to this conclusion recently after driving an E30 M3 with a larger inline-six engine from a slightly newer European-spec M3, and let’s just say that if you ever guessed a little 1980s 3 Series could move with some real urgency once it had approximately 315 horses, you guessed right. The motor in question is an S50B30. That code refers to the high-powered 3.0-liter inline six in the European E36 M3. You know how car people are always saying the American version of the ’90s M3 was awful, that it was underpowered and neutered compared to the one in the home market? The S50B30 was the “good” engine we didn’t get, and a worthy swap into a smaller, lighter car. I went to Harlem to drive this Frankenstein 1988 M3 because its owner, Mike Marte, emailed me out of the blue and asked if I wanted to. He also asked if I wanted to drive his pristine, mostly stock, low-mileage E36 M3. It seemed better than being in the office that day. When I arrived at Mike’s place I saw the white E36 parked on the street, its huge wing making it immediately pop out in a sea of boring grey sedans and crossovers. Then he pulled up in the E30, its swapped engine rumbling from a block away. “These are both yours?” I asked, starting the conversation. Who says nobody drives in New York? All this is to say Mike is a guy who lives, eats and breathes BMWs. He co-owns a shop in Queens, and he’s been wrenching on Bimmers since he was a teenager. He rarely keeps the cars for long, he told me, choosing instead to play with them for six months to a year or so before selling them. I get what he means on more than a few levels because I’m a fan of older BMWs too. I’ve put a decent amount of seat time in the E30 M3 and I also owned a 325e for about a year. The latter could be described as a “momentum car” if you were feeling charitable, but the point is I understand the mechanics and driving dynamics of both. I had to know how this car felt with the 315 HP engine swap under the hood. A bit of BMW history may be needed here before we continue. When the E30 M3 came out in the mid-1980s, it was primarily designed to be a homologation special for touring car racing—a means to an end. And the end wasn’t the marketing-palooza you get today where the M badge is on every BMW crossover. The 2.3-liter four-cylinder—codenamed S14—was a racing-intended engine that used the head from the M1 and M5 motor but with two cylinders removed. When new, that motor produced 195 HP and 170 lb-ft of torque. Those aren’t hugely impressive today, but the M3 engine’s main superpower was that it could rev to 7,250 rpm and really thrived in that upper range of the powerband. The downside, of course, is that you really have to wring it out for speed. It is a racing engine, after all. But the reality gets lost in the mythology. While now heralded as one of the greatest driver’s cars ever, the first M3 was not a strong seller in its day, at least not in America. Buyers wondered why they would pay more for a four-cylinder car when the six-cylinder 325is existed. It was a weird car for weirdos, and values didn’t really skyrocket until about the 2000s. So you can see why an engine swap appeals on an E30, and the S50B30 made sense to Mike. The E36 M3 was a heavier, more comfortable car, less of a racer. It left the four-cylinder behind for a more powerful straight six, but the E30 M3’s lackluster sales in America meant the sequel was ordered to be watered down somewhat to keep costs low. As the BMW Registry notes, our version lacked the double VANOS continuously variable valve timing and individual throttle bodies. So Mike’s E30 has the good E36 M3 engine, the one America should have gotten but didn’t. This one came from a car in Europe that took a nasty rear-end collision, but the engine was untouched. Total swap cost: about $15,000, Mike said. “Parts can be expensive since it is a European engine, and they can take weeks to get here,” he told me. Still, it is significantly cheaper to repair and service than the ultra-rare S14 is, he said. This motor has a few tweaks to get it to 315 HP from the stock 286 HP, including a Dinan chip, a high-flow intake and performance camshafts. It also has the six-speed manual from a European M3, Koni shocks, H&R springs and Brembo brakes—all in all, nothing too extreme. And it has the standard E30 M3 trappings, like the boxy wheel arches and improved chassis. I haven’t been in an E30 in almost a year, but the feeling of familiarity that hit me when I got in Mike’s car was surprising. Yes, my old daily driver didn’t have Euro gauges, a six-speed (originally those manuals only had five gears) or a wild engine roar and exhaust note at startup. But it felt weirdly natural for me to be back behind the wheel of one of these. I didn’t even feel like I was driving a new car, or someone else’s. Everything made sense: the thin pillars, the driver-facing stereo and HVAC controls, the seating position, even with Mike’s swapped-in Recaros. But familiar feelings all washed away once I got Mike’s E30 going. With this much power, there was none of the diesel-esque slow revs of my car, or the peaky power of the M3. This thing just goes, and hard. The big six’s rumble filled the cabin as I gave it gas up going up the West Side Highway, chasing behind Mike in his E36. It’s a good reminder of how magical BMW’s naturally aspirated engines used to be, and how we’ve lost that feeling in our current era of turbo everything: on these, the revs just build and build and build in a linear fashion. I kept my gears low and rpm high to chase properly. The thing has prodigious power, and it delivers it all smoothly. What it really reminds me of is the E46 M3: same kind of power, behavior, sound, you name it, just in an ’80s package. By the way, some quick math for you: an E36 with this engine would have weighed about 3,200 pounds. An E30 M3 would have been something like 2,800. So this engine in such a smaller, lighter car is a serious recipe for speed. And the engine, and the way it delivers power, never feels weird or out of place—it all feels natural here, like the big-six M3 that never happened. It never feels nose-heavy or too weighted down here either; it’s as fantastically agile as any E30. Is it better than the stock four-cylinder M3? Maybe, yeah. It’s got more usable, everyday power. It doesn’t have to work as insanely hard to move fast. And I’d argue that with this Euro-specific engine, it’s special in its own way. Either way, it speaks to the immense potential of the E30 platform when it’s loaded down with more power. As far as I’m concerned, there’s nothing this little car can’t do. After we stop for photos at The Met Cloisters museum—and are immediately chased off from the front entrance by a bored security guard—Mike tells me I should drive the E36 M3 too. Why not? It’s here, I’m here, and I haven’t even been in one of those in years. It’s also a rare chance to drive any car back to back with its immediate predecessor. As I mentioned earlier, the E36 M3 has kind of a rough reputation in the U.S. It wasn’t the tiny, rare, racing-derived car the E30 was. It was ubiquitous, coming in sedan and convertible forms as well as the coupe—and with an automatic option, no less. The American-spec lesser engine was rated at 240 HP and 225 lb-ft of torque, lagging way behind the Euro version. And it’s stuck between the legendary original M3 and the later E46, which is probably the best coupe BMW ever made. At least, that’s the rep it has. I think the negativity is overblown. The way I look at it, an M3 is an M3, and the E36 is an objectively good car. I also have this theory that the E36 is the ancestor to all modern sport sedans and coupes. In terms of size, weight, features, proportions and position in the marketplace, nearly all of today’s entries in that segment—the Jaguar XE, the Mercedes C-Class, the Infiniti Q50, you name it—are a lot closer to the E36 than the E30. The latter was almost like a 2002 with great electronics. This one is the car that set the paradigm. I’m largely proven right on the chase back to Harlem. Mike’s car—which is pretty much stock save for the exhaust, Dinan chip and racing wheel—is a lot of fun to drive. It happily revs and feels quicker than expected for a 23-year-old car, something that could easily keep up with a lot of metal from today. It’s a much better cruiser than the E30 was; more comfortable, bigger, plusher, and considerably more modern-feeling. The five-speed gearbox is a pleasure to use and the six makes a wonderful sound in my ears. If it had a turbocharged engine, a screen of some sort and no anachronistic touches like the separate little dials for the dual-zone climate control, you could easily mistake this for a car from today in how it drives. Overall it’s a lot of fun, and deserves much better than the reputation it has. But as I’m driving back and following Mike in his E30, I’m a bit sad. Jealous, even. That’s the car I’d rather be in. Maybe it’s former owner bias at work here, but I missed the smaller size, the ’80s weirdness, the thinner doors, and in this case, the bonkers engine size. Yes, the E36 is good, but it will always be the prince and the E30 will stay the king. At least, to me. And it’s proof to me that the original M3 was more than just its engine. It’s also proof that this car was truly meant to be driven and enjoyed, not turned into some garage queen waiting to appreciate in value. Maybe for you that means a kickass engine swap. I’d certainly recommend you consider it.